For those of you who like exploring new and exotic foods, here's one that may pique your interest. 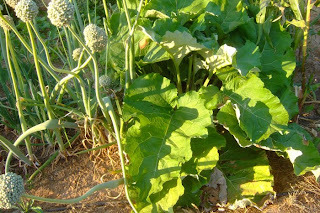 Last night we had the root of a plant known as the edible burdock (niupang). 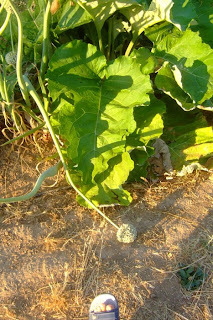 The taste and texture of the raw root is similar to a coconut but not creamy. 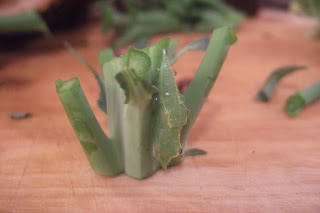 It is mildly sweet, and crunchy like a daikon radish. This cross section looks like the classic textbook image of a dicot root system. I do believe the pink ring is the cork cambium. 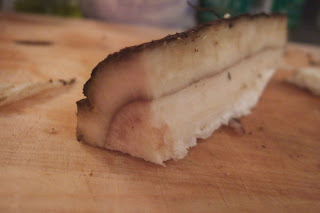 This segment of the burdock came from a plant my parents planted last summer. 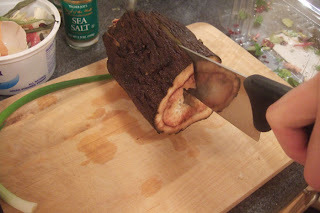 The ones you usually see in supermarkets have much slimmer roots—about 1-2 inches in diameter (this one was probably 4-5 inches)—but are probably more tender. Burdock on the right, onions on the left. I tried to stick my foot in for comparison. The leaves were HUGE! After cutting it all up, it was still a lot of fiber! 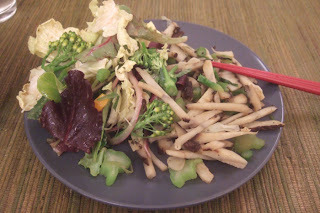 We stir-fried it with broccoli stems and made a salad. (The salad dressing was home-made honey mustard) A delicious and fibrous meal! 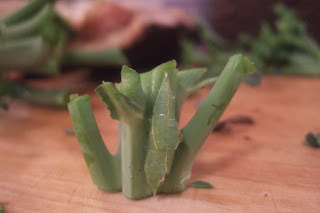 Speaking of broccoli—here's a little critter I found while chopping the flowers off for the salad. 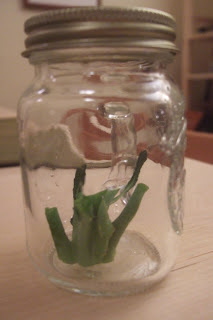 It was so well camouflaged that I didn't see it until I was cutting off the stems immediately next to it. I think it's a crystalis of some sort. To anyone who has read this far—what's an interesting food experience you've had? Tried anything new recently? What were your thoughts about eating something you've never ate before? 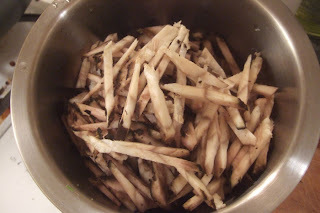 There is a traditional korean dish that uses burdock root. I had no idea what it tastes like raw, but the final product is sort of salty and sweet. Usually I try to be adventurous about food, since I *really* enjoy eating. However, I find that smell and presentation are super important, so if it doesn't look/smell good to me, then it's not likely that I'll eat it. I tend to regurgitate my food easily, so if it smells/tastes like alcohol or melon or is too fishy, then I can't really eat it. In the case of melon, I can't eat/drink/smell it at all. I've never really given presentation much thought, but you're right—it probably affects how we perceive the food. To me, melons don't particularly have a pungent smell or taste; what is so revolting about them?